If you look at power to weight ratio of the 150 bhp Kodiaq and 180 bhp endeavour both are exactly same I think around 93 hp/ton as I read in a comparison article. The suspension quality I feel is on the harder side. Feel the ride quality bad even after reducing the PSI to 35. Got to check whether it is due to MRF tyres or because of the suspension itself. Even small uneven surfaces on road sending the vibrations to the seats and causing a rattle in the tablet holders. Somehow, when I test drove I didn't feel the ride was bad!!. I have driven the one with MRF and I didn't notice any issue with ride quality side / rattling!. But yes, unlike you, my drive was for a short distance..
1. Looks, the minor exterior additions(body colour all the way to the bottom of the door sill, use of chrome and silver roof rails) make it look much better and proportionate than the style variant, better alloys and front/rear bumper will really make it look wicked. 2. Practicality/functionality, for instance you just walk in the cabin. 3. Feature list, quite impressive, the TFT LCD drivers display is worth the special mention. Ventilated seats, a big Miss! 4. For some reason the seats in the skoda range are really small, from the height to the bench length(the VRS editions with the bucket seats are much more supportive) it really is not for tall folks, under thigh support is extremely poor. 5. Engine, oh boy what a disappointed, the only thing masking it’s incompetency at city speeds is the the gearbox(it really is that good) but quick accelerations and highway speeds you’d really feel shortchanged after paying so much, even in sports mode. So the engine pretty much rules it out from coming to my house. Will be test driving a lot more cars so I shall be updating the respective threads. For me, i didn't feel the seats were small.. But yes, I felt that overall seating was better in Endy. Not sure if it was because of overall height difference (assuming you are trying Endy too). But this was not much of a concern for me. Fully agree on the engine and gearbox observations. I felt it was just enough. But then 'just enough' in this segment was not acceptable. But then there were other features that were good like memory for both front seats and all 4 one touch windows, which are missing on competitors though even Vento/Rapid has all 4 one touch windows..
Btw, Is tyre pressure monitoring available in Kodiaq? Style variant? I must say, I continue to be impressed with Skoda service and responsiveness. After my good first service experience this time was a part replacement under warranty. One of my headrest arm had come out...they replaced it under warranty. Actually replaced the full head set under warranty. Honestly, I was ready to pay for it, because this was not really a defect as the piece fell off when I drove really fast over an unexpected hump, while the passenger was using it to well..sleep. Can somebody who knows, please explain to me how this EMI works out? I know that there will be a downpayment & yearly bullet payments involved. I don't want to go to a showroom & enquire for some reasons. 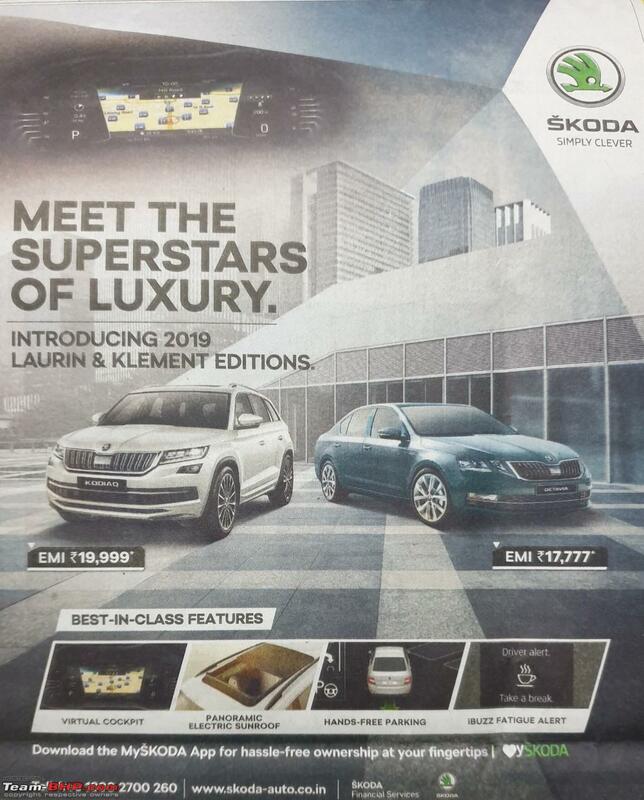 PS: Posting the same to Skoda Octavia Official Review also, to get more responses. You don't know from where you get answers until you do. I had got curious about similar offers (so called) on Kodiaq but when I signed up to get more details, the lady who had got back did not know the details and I gave up. My hunch is , since the EMI of 20000 for 7 years will cover only about 10 lakhs, rest 34 lakhs will be recovered from 20 lakhs of downpayment and yearly bullet payment of 2 lakhs. But why they need to carry this misleading ad is funny. I had taken the car to the Mahavir service center in Vijaywada for the suspension noise on Friday. Had confirmed with the service center 2 days ahead and they were very much obliging though they has no free appointment. The service experience and quality is just awesome nothing short of what a premium car like this deserves. Once the vehicle landed the driver seat steering and gear knob all were covered with plastic before anybody touched the car (unlike what i saw in bangalore at Vinayak skoda where cleanliness was very bad). Later a team of people with all the senior technicians took the vehicle to the body shop identified the problem (which wad actually a loose bolt in the subframe). The torqued the nut properly and gave me a test drive and the noise was completely gone. Regarding A/C there was a slightly less coolant about about 100 grams which was topped up. The vehicle was delivered to be before lunch. I had travelled about 900 kms for this but dont regret as the overall experience was nothing short of a 5 star rating. I enjoyed the drive as it was the golden quadrilateral highway. Finally piece of mind. 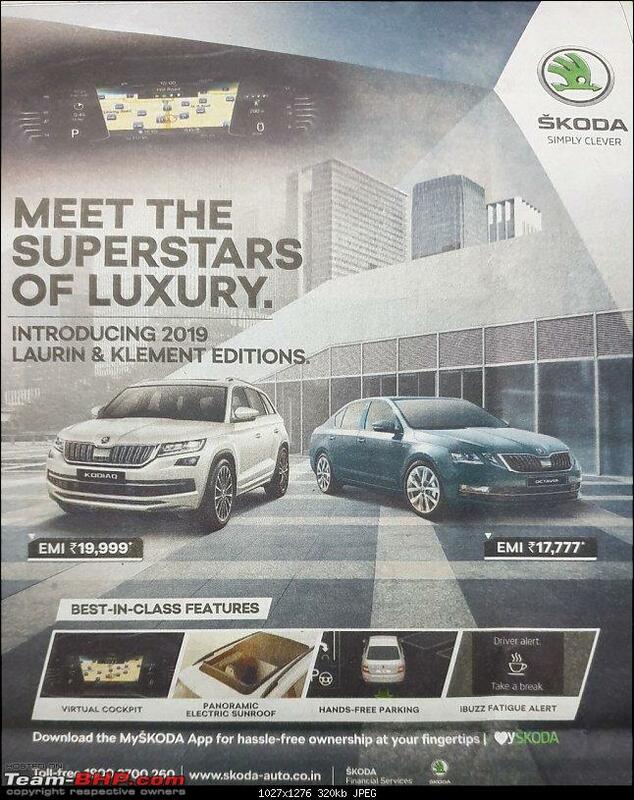 But from the manufacturing side I would expect skoda to be more careful in such things. Regarding the A/C of the kodiaq how many of you feel that its difficult to get that perfect desirable cooling at any time of the day unless you do lot of manual adjustments. The automatic cooling if used either cuts off too early or kicks in too late so that your are left chilled or sweating. I tried it even the automatic fan in the high setting mode. I feel such high end cars by just adjusting the temp you should be able to get that ideal temp maintained at all times. There is a sensor placed on the fan speed knob. I feel there should be a sensor at the back of the car which should record the temp because that sensor reading will be accurate and the A/c cut off will be perfect. Having a sensor in front will obviously sense cooling directly from the vents above and cut off early. Anyone else feel the same about the a/c if no then I have to get my sensor checked during my first service. And having a separate blower for the rear would have been great in a car of this size. I faced a similar issue with my Octavia. It's actually better to use it in manual mode. Keep the AC Temp at "LO", and then adjust the fan speed according to your preference, and try and keep it in Re-circulation mode . The main issue, is that the on-board computers also control the re-circulation and fresh air changes in Auto Mode. That most often causes the disruption in the temperature readings. Yes today I did that, I used manual mode and it was chilly. I initially kept it at 18 for the cabin to cool and later increased temp to 24. I also saw that the A/C is adjusting the cooling based on outside temp. I realized that when the outside temp grew by 1 degree the fan speed used to increase. So if the outside temp is 26 and you set 24 inside the a/c cut off was very early and we were feeling hot. So I basically figured out that its the difference in the temp of outside climate and set temperature that actually targeted compressor cut off. Checked out the heritage link on the Skoda official website and was mighty impressed by it. Especially check out the VR drive on the vintage Skoda. Regarding the A/C of the kodiaq how many of you feel that its difficult to get that perfect desirable cooling at any time of the day unless you do lot of manual adjustments. Lack of good cooling is my single biggest gripe about my Kodiaq. For whatever reason the AC just not adequate. I have complained about this in my first service and they did a through check & found nothing amiss. The SA commented that it is a European car and this is the best the AC can chill! Is this a general problem or only on 3rd row?. How is it in the front and middle rows? I had a VW before and I didn't face any issue. And I didn't feel it in the Octavia/Jetta that I have tried. So this European car and Euro v.s. Indian weather story is not convincing for me.